Star Citizen was shown off at the CitizenCon event in Manchester this weekend, and it was revealed that the game will feature an all-star cast including Mark Hamill (famous for his portrayal of Luke Skywalker in George Lucas’ movies), Gary Oldman of Batman fame and even X-Files star Gillian Anderson. And Chris Roberts is behind Star Citizen, the biggest crowdfunded video game to date, with backers having pledged more than $90 million (£58 million) to the project. This has allowed Robert’s company, Cloud Imperium Games (CIG for short) to hire that all-star cast for the game’s campaign, which is known as Squadron 42. And Chris Roberts is no stranger to directing big-name actors, as he already worked with the likes of Mark Hamill and John Rhys Davies (who will also feature in Star Citizen), having directed both actors in the live action sequences of his Wing Commander games in the 90’s. That was a time when the “interactive movie” was in vogue, and best-selling games like Command & Conquer had live action bits featuring real actors. And Robert’s even directed a movie based on his Wing Commander games back in 1999, which sadly was not well received. But since the “interactive movie” is a thing of the past, Star Citizen won’t feature live action sequences. 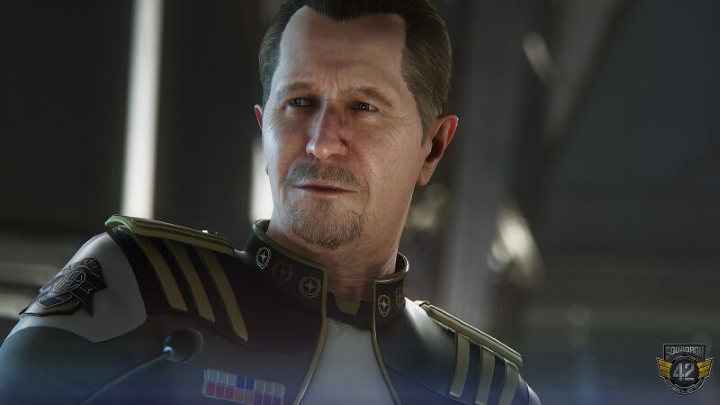 Rather, the likes of Mark Hamill and Gary Oldman will instead lend their likenesses to the game, performing motion capture and doing voice work and not “acting” like they would in a Hollywood production (see Gary Oldman’s character model, Admiral Bishop, in the video below). And hopefully Star Citizen, an epic space sim that offers an ambitious multiplayer mode that allows gamers to explore an entire universe, piloting and dogfighting aboard an enormous amount of spaceships (and even features first-person shooter boarding sections) will turn out to be a great game. After all, Chris Roberts has not directed a game in more than a decade, with his last major release being the space sim Freelancer back in 2003. There have also been troubling reports of the going-ons at CIG, with allegations of discriminating hiring practices and employees quitting due to the toxic work environment at the company. And it has even been suggested by some that Chris Robert’s company might be running out of funds, allegedly having misspent backers money, with former employees even accusing Roberts and his wife of buying their Pacific Palisades mansion with the game’s crowdsourced funds, claims Roberts has denied. But still, here’s hoping that industry veteran Chris Roberts is able to deliver with Star Citizen, and if its star-studded single player campaign is anywhere near as good as that of Robert’s earlier Wing Commander games, then gamers are in for a treat when Star Citizen finally sees the light of day.